Stewart is currently wrapping up final design on the westernmost extension of the Crabtree Creek Greenway, which will connect the Umstead State Park to the existing western trail terminus. Upon completion of this segment, the trail will extend 16 miles from Umstead State Park to the Neuse River, giving it a prominent place among the longest trails in the state of North Carolina and a key link in the Triangle greenway network. 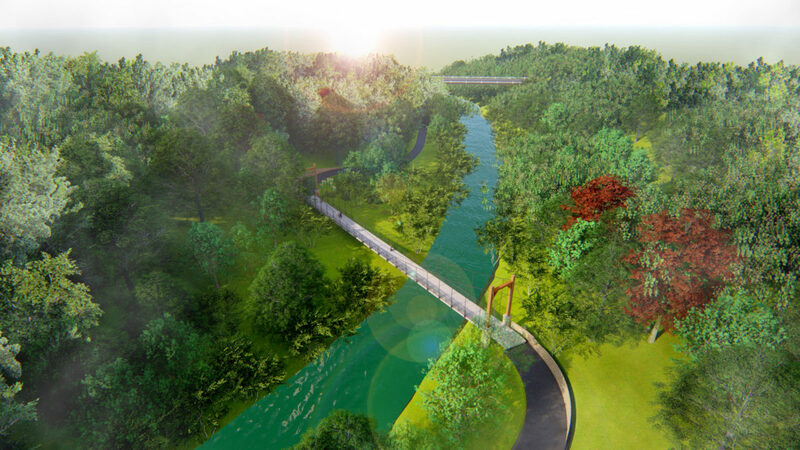 The project includes the design of four prefabricated bridges, one 220-foot signature suspension bridge over Crabtree Creek, 400 feet of boardwalk, and a new trailhead with 60 parking spaces. Stewart provided planning and design services for the project. The proximity to residential neighborhoods required a proactive approach to public involvement including two public meetings, social media, and a corridor walk-through with residents to provide a better perspective on the relationship between the greenway and proximity to their homes. This up-front transparent approach garnered much support for the project. Other services included GIS and field planning to establish a preliminary alignment, surveying, property acquisition support, NCDOT encroachment agreements, permitting, constructibility review, drainage, structure design, and construction access design. Like many greenways designed along creeks in flood prone areas, there are often concerns for flood rise. This project has five bridge crossings, including two bridges crossing Crabtree Creek which is subject to regular flooding. While evaluating the bridge location during the flood study, it was determined that the bridges crossing Crabtree Creek required significant elevation to prevent flood rise upstream. Raleigh’s typical prefabricated bridge standard would require cranes on each side of the creek. With access only available on one side, the team determined that a site-constructed suspension bridge was necessary. The City obtained LAPP funding to supplement additional construction costs related to the suspension bridge.